SQL Server provides its users a secure option for encrypting SQL database objects which helps to prevent the unauthorized user. A locked door without key raises certain difficulties. our aim is to offer a highly durables service as well as software that deal with such issues in all the arenas of the database. So just admire our terrific services which is able to decrypt SQL Server database objects. Decrypt SQL stored procedure, fuctions, views, triggers. Remove encryption using Windows & SQL Server Authentication. Remove encryption from large SQL database file. Decrypt database files of SQL Server 2014 & below versions. Support Windows OS 10, 8.1, 8 & below versions. 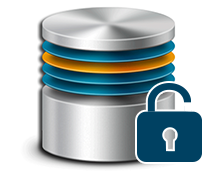 SQL database decryptor is helpful in removing encryption from SQL database objects like stored procedures, functions, views, triggers and make it completely accessible to database user. After successfully connecting with SQL Server, the SQL decryptor will preview the list of all the encrypted database objects like stored procedures, functions, views, triggers before you going to decrypt. 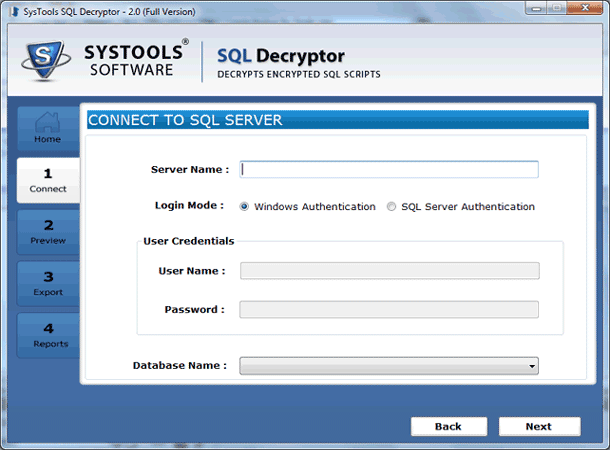 SQL decryptor allow you to remove encryption from SQL Server 2000, 2005, 2008, 2012 & 2014 databases. Software does not make any changes on the script of encrypted objects after decryption. While saving the decrypted database objects, SQL decryptor software allow you to select or deselect the database objects and export it directly to SQL Server database or export as a SQL Server compatible script. 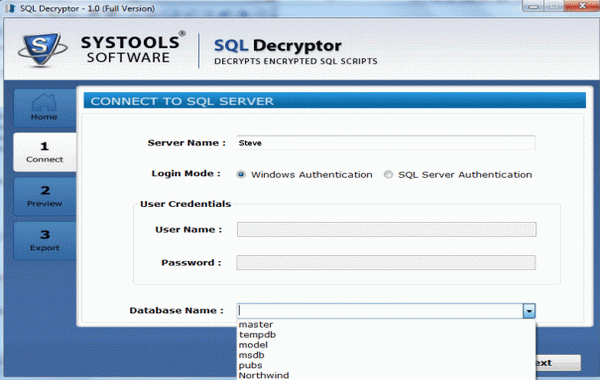 SQL decryptor is an online utility which works on live environment of SQL Server database and decrypts database objects of SQL Server 2014 & below versions. while decrypting SQL database objects using SQL decrption tool, you can select either windows authentication or SQL Server authentication to remove encryption from SQL Server stored procedure and other database objects. 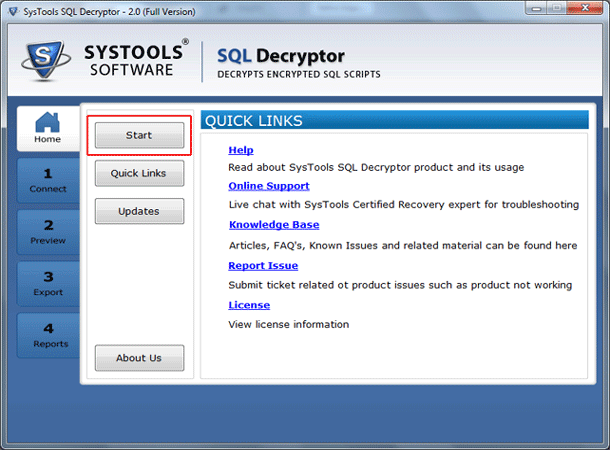 Launch SQL decryptor tool on your system. Preview all encrypted objects of your databases and click on next to export them. Select desired database objects then select export option with output mode to target database and click on export to complete the process. We are the leading service provider in the arena of decrypted SQL Server databases. Expert team of DBAs helps turning the ciphered databases to deciphered mode to keep the business activities on the go. We understand that inaccessibility of the database instance can affect the efficiency and responsiveness of any organization and this further affects the operations and the monetary parameters to a greater extent. We render support services for encrypted databases, symmetric and asymmetric keys' pairing and mismatch and many more. A new feature has been added to SQL Server 2005 and later versions i.e. Encryption. Through encryption one can protect data available on the Server from the attack of hackers. With the high level of security provided to the SQL Server penetration to the database becomes difficult and the data is preserved. A new encryption feature, Transparent Data Encryption (TDE) is added to SQL Server 2008 which assures protection to entire database without affecting any existing applications. Can I decrypt SQL stored procedure of SQL Server 2014 version? Yes SQL database decryptor can easily decrypt encrypted SQL Server stored procedure of SQL Server 2014 & all below versions. Do I need to provide live SQL Server environment to use this SQL decryptor? Yes, Software require for live SQL Server environment to remove encryption from SQL database objects. Does this tool decrypts database objects using SQL Server authentication? Does this software shows all database objects created in my database? 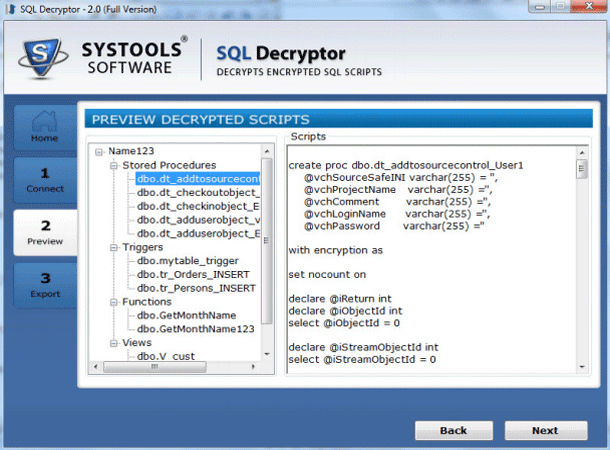 No, SQL decryptor tool only shows encrypted database objects. I was trying to decrypt encrypted SQL Server stored procedure of my SQL Server 2014 database which was encrypted using WITH ENCRYPTION. but can't decrypt it. At last I tried SQL decryptor tool and removed encryption from my SQL Server stored procedure. . I have few encrypted SQL database files that I wanted to export in latest SQL Server 2014. 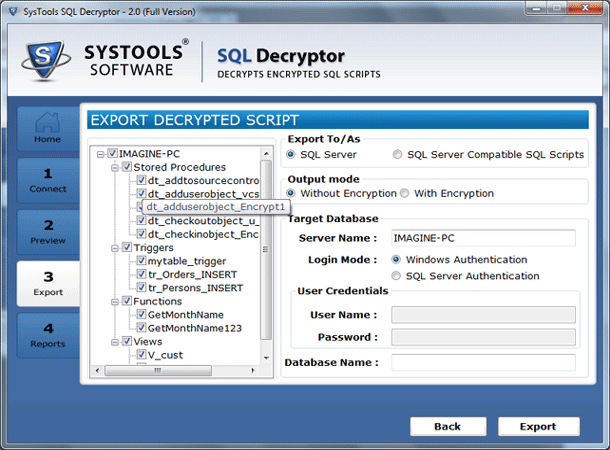 SQL Decryptor tool is brilliant application designed to remove encryption from SQL files and export them in latest SQL versions, thanks a lot guys for helping me out from difficult situation.